Ross Brawn is back with a vengeance to buy the Honda F1 team and rename it the Brawn F1 Team. Did you know he has the world's largest brain? We present photographic evidence from space. 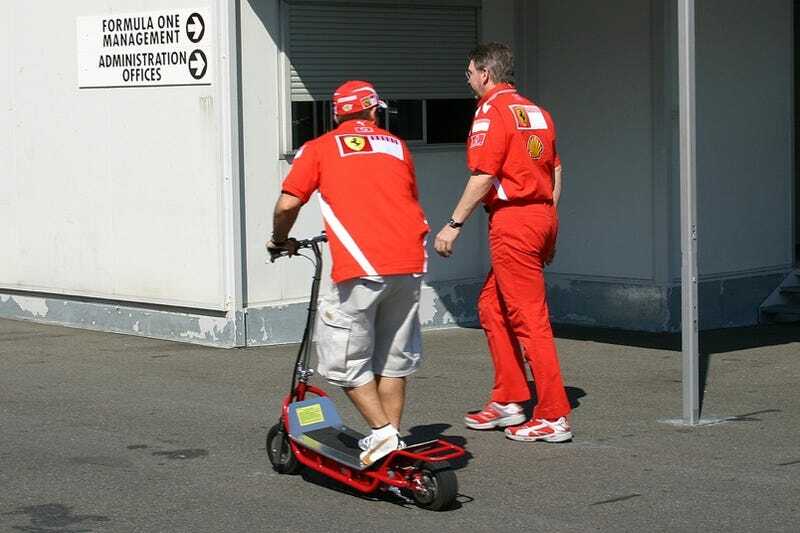 Ross Brawn is back! If you’ll recall, the man who made Schumacher the Superman of Formula 1 racing left Ferrari at the end of the 2006 season and ended up at Honda after a one-year sabbatical. Honda was particularly hard hit by the Carpocalypse and decided last December to abandon its F1 efforts. An agreement has now been reached to preserve the team, with Brawn as its new owner and namesake. Brawn GP will swap its Honda engines for Mercedes V8’s and immediately hit the track at Barcelona on Monday. Honda drivers Jenson Button and Rubens Barrichello will remain with the team as they take to their first season on March 29 at the Australian Grand Prix. This is absolutely wonderful news. As for why, you only need to call to mind last year’s British Grand Prix at Silverstone. It was a motley ballet of a race, with the recurring gag of a hapless Fernando Alonso spinning his car at every corner and a bunny speeding across the rain-soaked track. Lewis Hamilton massacred the field, but the most remarkable part of the race happened on lap 40. This was when Ross Brawn, in anticipation of more rain, decided to put Rubens Barrichello on extreme wet tires as opposed to the intermediates on every other car. Then the rain came. Barrichello’s Honda, a hopeless non-contender througout the season, went through the field like butter, outpacing everyone by nine seconds a lap. He ended up at third place, by far the best result for Honda in the entire season. Yeah yeah yeah, you put on wets when you see the clouds, but if the rain doesn’t come, wet tires slow your car down like molasses. It was a brilliant hustle, but one built on a foundation of data, which Brawn reputedly has an infinite capacity to spot patterns in. Not evident on most Formula 1 newscasts due to its invisibility to the naked eye is the extremely large outboard brain attached to Ross Brawn’s cerebrum. A picture of which we have obtained with Jalopnik’s imaging satellite parked above the Japanese Home Islands. It really is one bad mother of a brain.